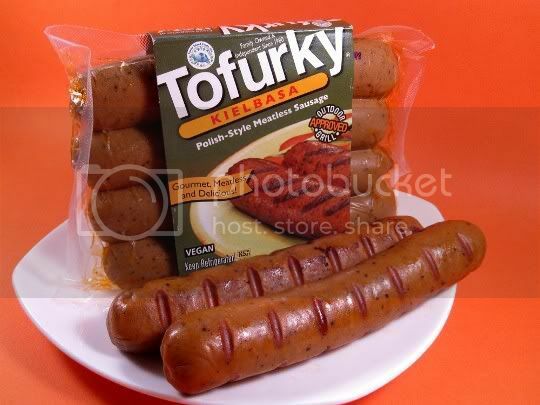 One of the great faux-meat companies, reliable ol' Tofurky doesn't fail with these hearty, meaty, great-flavored Kielbasa-style sausages. They're perfectly seasoned and salty, with strong black pepper and garlic flavors. Better yet, they don't have a big "faux" taste like some other brands do. Even the texture could probably fool meat-eaters: they're chewy, meaty, and they hold their shape very well when cooked. I cooked mine on the George Foreman, but I bet these would be amazing on the real grill. The "casing" has a bit of a bite to it, and although the inside sometimes seems just a tad rubbery, it's really quite good. Unfortunately, one of the things you have to watch out for with the faux meats is the sodium content. Tofurky Kielbasa is a perfect example of that. They are high in sodium and surprisingly high in fat (for one). But if you eat two of them, on the other hand, you'll be consuming almost a day's worth of protein and fiber! And who said veggies don't get enough protein?! Buy again? Yes. I'd limit myself to one per serving, but I can't wait to get some of these babies on the grill! I'm a bigger fan of the Tofurky Beer Brats, myself. But you're right about the texture!